Anders Sunde Wroldsen's 2007 PdD thesis was called, "Modelling and Control of Tensegrity Structures." The thesis is about the use of tensegrity structures for marine agriculture. The first chapter is an excellent introduction to tensegrity; he includes an image of Ioganson's 1921 model -- something that Robert Burkhardt mentions in his Practical Guide to Tensegrity Design. In the acknowledgments, Dr. Wroldsen notes that he visited Snelson and had a very interesting conversation in Snelson's Manhattan studio in November, 2006. The thesis features an appendix talking about finite element analysis of a tensegrity mast like Snelson's "Needle Tower". Dr. Wroldsen prefers the term "tensegrity beam" to "tensegrity mast". Wroldsen was awarded a patent for, "Marine Structure For A Fish Cage For Aquaculture With A Net Spanned By A Tensegrity Structure." A large strength to mass ratio. As the tensegrity structure may be designed to be flexible, a locally focused external force acting on the structure may be distributed to a plurality of elements of the structure, so as for the acting force to be dissipated in the structure. Compressive elements (rod, bar) are subjected to compression force solely, thus no bars are subject to any torsion moment. However, if the structure is heavily loaded, one may experience that some compressive elements momentarily may be subjected to tension. The compressive elements may be slender and we may expect most of the external forces acting on each compressive element and also on the tensile elements, to originate from fluid flowing around, along and possibly through the bars and the tensile elements. Tensegrity structures may have advantageous properties with respect to shape, motion and vibration control by adjusting the tension or/and length of the tensile elements. It is also believed that tensegrity structures may be developed in order for propulsion to be achieved by proper interaction between subelements. The present invention which may represent solutions to one or more of the above-mentioned problems, the invention being a marine structure such as a fish cage for aquaculture, with a net spanned by a tensegrity structure, i.e. a structure comprising compressive elements and tension elements. One embodiment of the invention comprises a marine structure of in which the tensegrity structure comprises hexagonal cylindrical basic cells. A preferred embodiment of the invention comprises a tensegrity structure forming a flexibly deformable ring for being arranged near the surface or under the surface of the sea, for spanning said net inside or around the tensegrity structure, or for hanging said net in the sea below the ring, said net arranged for enveloping a number of fish or other marine organism. A jump net may also be arranged if required. In another embodiment of the invention the tensegrity structure may form a flexibly deformable hemispheric structure spanning said net arranged for enveloping the fish. The net may attached to the structurally outer or inner surface formed by the hemispheric structure. In a further alternative embodiment the tensegrity structure may form a flexibly deformable and closed, preferably tube-shaped structure arranged for spanning said net. A marine structure like a fish cage for aquaculture, with a net (90) spanned by a tensegrity structure, i.e. a structure comprising compressive elements (1), and tension elements. 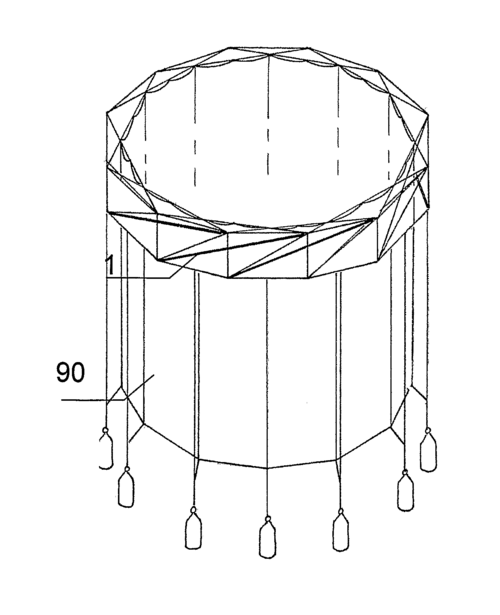 From Wroldsen's patent for, "Marine Structure For A Fish Cage For Aquaculture With A Net Spanned By A Tensegrity Structure." WIPO PCT/NO2005/000425. This page was last edited on 28 November 2018, at 06:15.